We are pleased to announce some changes coming to the commander system. With the arrival of the September 2014 Feature Pack, Commander’s Compendiums will transition to be accountwide unlocks. You’ll always be able to use any character you’d like to help lead your comrades! Up until now, commander tags have been character bound. With the added functionality of becoming account bound and the addition of new colors to choose from, the price of the Commander’s Compendium will be adjusted to 300 gold. Whether you have three characters, thirteen characters, or even more, you will need to make this purchase only once! Existing commanders will be grandfathered into this new system. If you’re already a commander, please enjoy this additional upgrade. This new assortment of colors will facilitate a range of tactical uses. For example, in World vs. World, you could select one color to represent an assaulting commander and another to designate a defending commander. 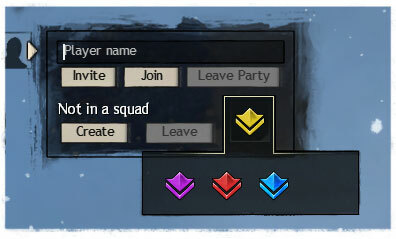 In open world events, you might coordinate your efforts with other commanders by tagging up with different colors to help organize groups. Or you can just grab your favorite color to stand out from the crowd! Moving forward, we’ll be evaluating future possibilities for recognizing experienced and prestigious commanders. Right now, we’re excited to empower commanders with the ability to use all of their characters and choose the color that best fits their needs! We can’t wait to see all the ways this feature is put to use.